A CABINET that serves a cigaret already lighted and glowing at the tip, ready to smoke, is the latest luxury for the smoker. Now the smoker can go right on with the conversation or the bridge game without bothering to look for cigarets or matches, it is claimed. 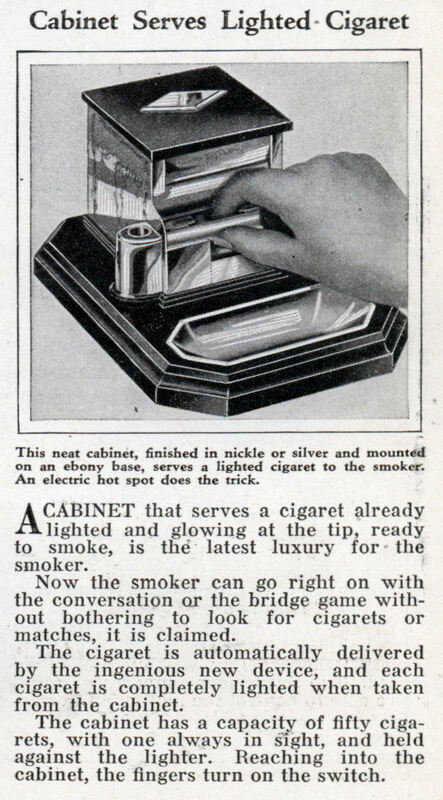 The cigaret is automatically delivered by the ingenious new device, and each cigaret is completely lighted when taken from the cabinet. The cabinet has a capacity of fifty cigarets, with one always in sight, and held against the lighter. Reaching into the cabinet, the fingers turn on the switch. I wonder if chain-smokers were able to overclock this to get ’em faster?